Aweeeeeeeeee. I love your baby Lily picks. My favorite is the beauty in the mirror. Love you baby Lily pix. AWWWWWWW! Have a serene Sunday and let us all partake of some big easy today. It's great to see flashback-photos! 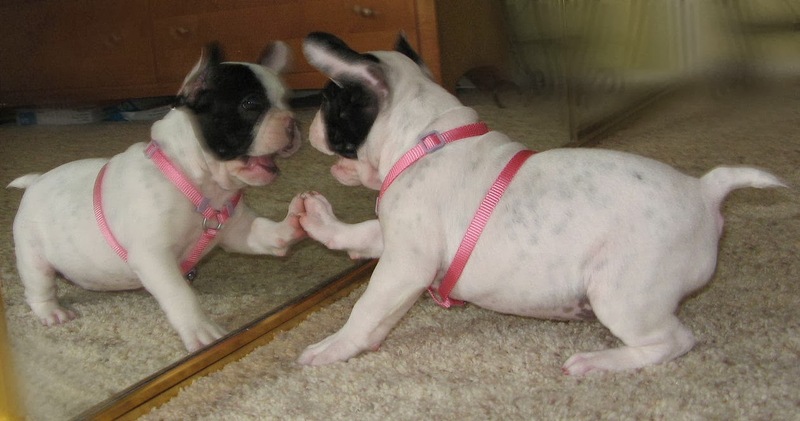 oh and who is taht cute girl in the mirror? MOL MOL MOL Baby Lily that pup in the mirror is a copy cat! Oh how my MOM wants to rub rub that belly. I will offer her mine in place of yours. So very cute, Lily! Then AND now. Sooooo cute!! Have a great Sunday. Awwwwe Cute as a button! Awwwwwwwwwww - you were such a cute baby, Lily! Hope someone blew raspberries on your little fat baby tummy. so adorable! Happy Sunday to you! Love baby pup pics! Lily you were. Such a cutie! Aaaaawwwwwwwwwwwwwwww Little Lily was Darling. Grown up Lily ain't bad either... Just sayin!! Wow, Lily, you were just the cutest little pupsqueak ever! OMD the doubleLily was great and I like your work with the toilet paper. BWAR HAR HAR Adorable. All Lily's aresa absolutely adorable'ums, dontcha agrees, Lily? Could you beee any cuter! Squeeeeeeeeeeeeee!!!! What a cutie pie you were and are Lily! Always cute and always a spitfire! OMD Lily...mom just melted off her chair, she cannot resist cute puppy pictures! Do you still have all those freckles on your tummy? I love them! Oh my goodness Lily! What a totally precious baby you were and you've STAYED precious too.....!!! AW, look at you!!! Roly Poly Belly and all! OMG, you were such a cute little thing! ohhh I bet you still feel like a little puppy! Lily you were super cute as a baby, I love that puppy tummy in the last photo, you have the bestest photos as a puppy, Mum says she wants to take you home and to be honest you would be a great sisfur to me!! You look beautiful as a baby and now! Sorry, I just had to do that. The mirror picture was just so adorable.